O.E. 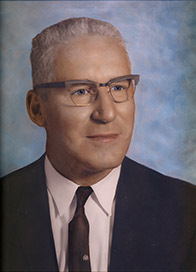 Pilson was a beloved educator and researcher in both the genealogical and local history fields. He was known as the Patrick County Historian, having been born in Patrick County, but having lived most of his life in Henry County, he was also an expert in Henry County history. Born May 11, 1910 in Patrick County, Ophus Eugene Pilson was the son of the late Rufus Virgil Pilson and Sarah Lawless Pilson. He was a principal at Drewry Mason High School and Ridgeway Elementary School for a total of 37 years. After retirement, he researched the history of cemeteries in Patrick County and his "Tombstone Inscriptions of Patrick County, Virginia" was the only book published by Pilson. He then assisted the Patrick County Historical Society in writing a book on the history of Patrick County, and the Pilson Collection contains much of his research for this book. Mr. Pilson's office was in a house beside his residence in Ridgeway, Virginia where the entire house was used for his research, books, notebooks, loose papers, and files both in genealogy and history of the immediate area. He had requested that his collection be moved to the Bassett Historical Center after his death. Mr. Pilson passed away in early 1999 and in July of that year his collection was moved to the Historical Center. Not only are people in our area familiar with the work of O.E. Pilson, but people from across the United States visit us at the Historical Center to use this enormous collection. We have 995 family files in the Pilson Collection, plus family notebooks that line the shelves in the room that houses this vast Collection. We at the Historical Center feel fortunate to have known Mr. Pilson and to have learned from him. We are extremely honored to house this wonderful collection.